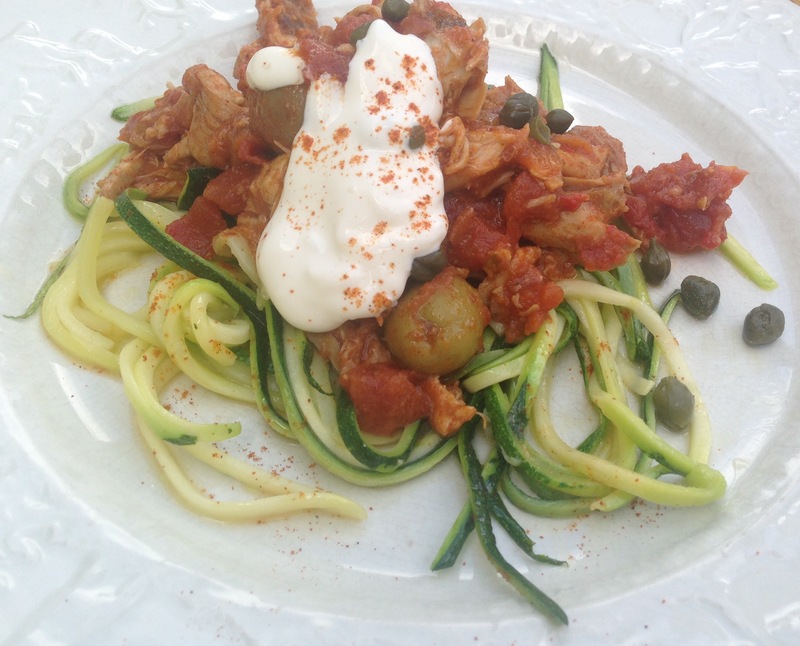 I lighten up the standard cacciatore recipe and replaced the pasta with zucchini – still warm and filling and easy to make ahead, just sauté the zucchini right before serving. Heat a sauté pan to medium heat and add the butter. Add the onion and stir until they start to turn light brown. Add the, paprika, red pepper flakes and stir until fragrant. Add the chicken broth, wine and tomatoes and stir to deglaze the pan. In a Dutch oven (or an oven safe pan with a lid) place the chicken and the olives. Pour the tomato mixture over the chicken and olives. Cover and braise for about 2 hours or until the chicken is very tender. Remove the chicken to a cutting board and with two forks, pull apart the meat, remove the bones and return it to the pot – stir to combine. This entry was posted in Recipes and tagged Canned Tomatoes, Chicken Thighs, Make ahead, Zucchini. Bookmark the permalink.